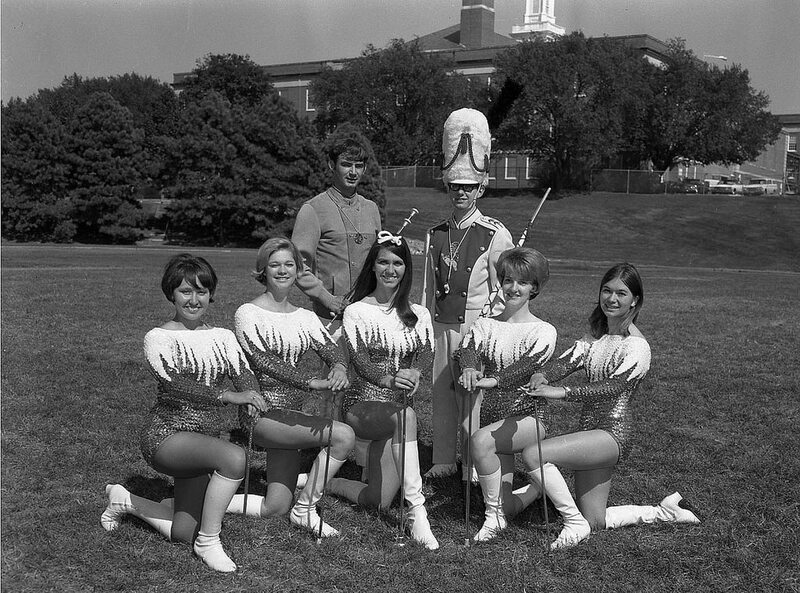 Established in 1928, the UNO Bands have been in existence for close to one hundred years. All of our concert bands are open to students of all majors across campus! Click here to learn more about participating in one of our concert ensembles! The UNO Bands are comprised of some of the most visible and active organizations in the College of Communications, Fine Arts and Media. The UNO Bands include two concert bands (the Symphonic Wind Ensemble and the University Band) and two athletic bands (the Maverick Marching Band and the "Maverick Machine" Pep Band). All of the bands perform literature of the highest caliber and are open to students of all majors across the UNO campus. As UNO's premier concert band, the Symphonic Wind Ensemble (SWE) has developed an exemplary reputation throughout the country and abroad for its exceptional performances of high quality traditional and contemporary wind literature. Comprised of some of the most outstanding musicians on campus, SWE performs an average of five concerts a year—including the annual BOCH Festival Concert at the Holland Performing Arts Center. The ensemble has performed at regional conferences of the College Band Directors National Association, multiple conventions of the Nebraska State Bandmasters Association, several Nebraska Music Educators Association All-State conferences, and numerous other regional and national professional conferences. The Symphonic Wind Ensemble has also performed abroad—giving concerts in France, the Czech Republic, Austria, Germany, Poland, Lithuania, Latvia, Estonia, Sweden, and Denmark. The Symphonic Wind Ensemble rehearses Mondays, Wednesdays, and Fridays from 1:30-2:50 PM at the UNO School of Music. Students may enroll for SWE (MUS 4160) pending a successful ensemble audition prior to the start of the fall semester. The Symphonic Wind Ensemble is under the direction of Dr. Karen Fannin. 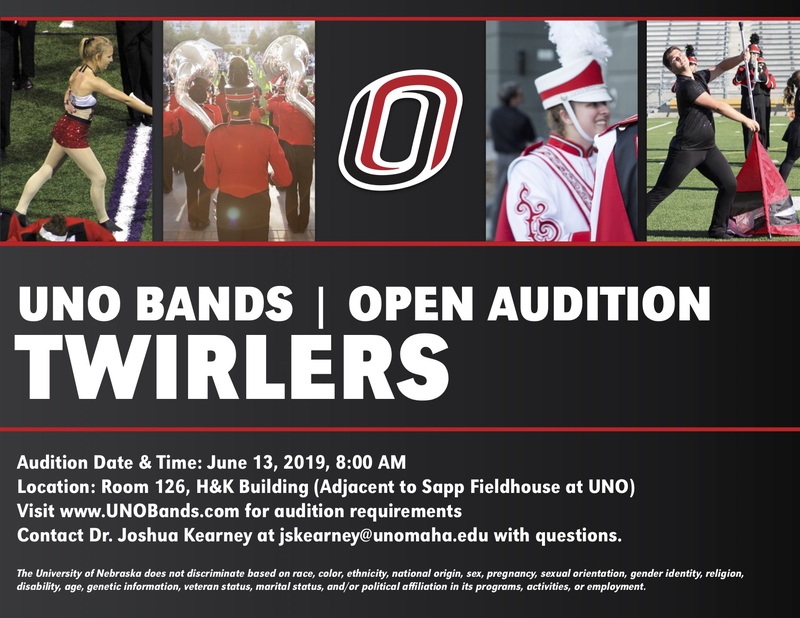 The University Band is a non-auditioned ensemble open to all UNO students, faculty, and staff. The instrumentalists involved in this group perform a large variety of high-quality music for winds. 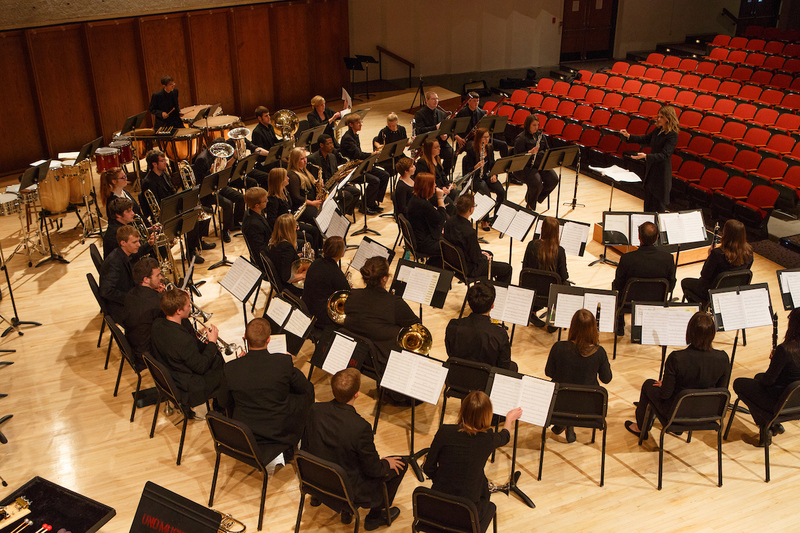 The University Band performs two concerts per semester on UNO's campus. Students interested should register for the course in order to participate (MUS 2760). The University Band rehearses every Tuesday and Thursday from 4:00-4:50 PM during the fall and spring semesters at the UNO School of Music. The course may be taken for General Education credit. The University Band is under the direction of Dr. Joshua Kearney. The Maverick Machine is the University of Nebraska at Omaha's resident pep band at the state-of-the-art Baxter Arena. The Maverick Machine rehearses on Tuesday evenings from 8:00-9:30 PM in the Strauss Music Building room 109. 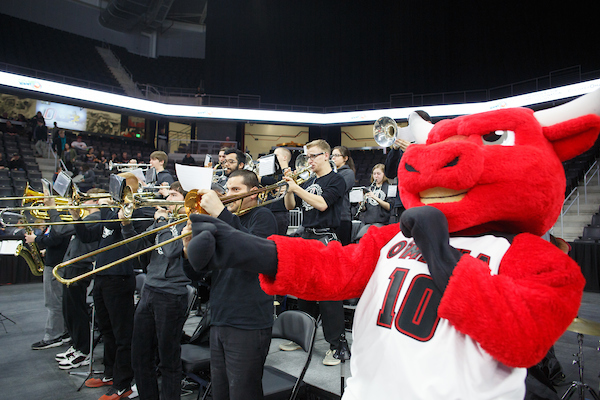 The band plays for UNO volleyball and basketball games as well as for our nationally-ranked hockey team. Auditions generally take place during the first few weeks of classes in the fall semester. All full members of the Maverick Machine receive $500 for their efforts.